Editor’s Note: This piece was originally published in the Middle East Institute’s Viewpoints Special Edition: The Iranian Revolution at 30 (January 2009). Thirty years ago, Ayatollah Khomeini proclaimed equity and social justice as the Revolution’s main objective. His successor, Ayatollah Khamene’i, continues to refer to social justice as the Revolution’s defining theme. Similarly, Presidents Khatami and Ahmadinejad, though they are from very different political persuasions, placed heavy emphasis on social justice in their political rhetoric. Yet the very fact that 30 years after the Revolution social justice continues to occupy the highest place in Iran’s political discourse implies that this goal of the Revolution remains as elusive as ever. Inside Iran the facts regarding the evolution of equality are hotly debated. However, data from the Statistical Center of Iran offer evidence of how inequality has changed in terms of household expenditures, education attainment, and access to health and basic services. The picture that emerges is a mixed one: success in improving the standard of living and the quality of life for the poor, and failure in improving the overall distribution of income. 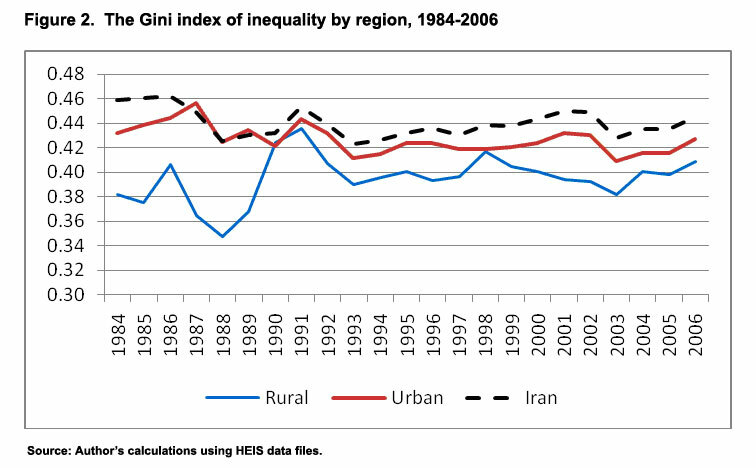 The most obvious, if not quantitatively most important, source of inequality in Iran is the rural-urban differential. 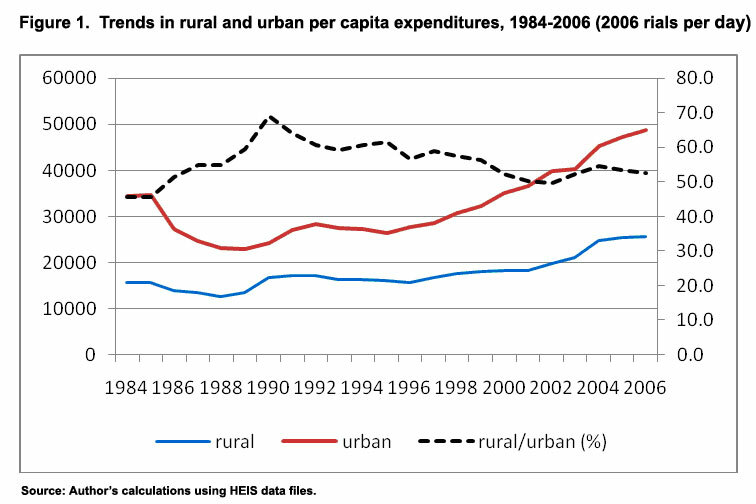 Figure 1 shows that during the great economic downturn of 1984-88, average expenditures in rural and urban areas fell by 20% and 33%, respectively, narrowing the rural-urban gap in expenditures. Rural incomes continued to grow faster than urban, raising the rural-urban ratio to a historic high of 69% in 1990, before falling back to 53% in 2006. The widening rural-urban gap in the last 15 years has contributed significantly to the resilience of measured inequality in the country as a whole. Immediately following the Revolution, overall inequality fell substantially, by about 10 Gini points, from 0.56 to 0.46, but has since remained fairly stable at levels well above those observed in countries such as Egypt (see Figure 2). It is nonetheless much lower than in Latin America. Rural inequality, which was much lower than urban inequality during the war years (1980-88), increased sharply after the war, reaching the urban level, most likely because of government policies such as ending the rationing (that had protected the poor from inflation during the war) and permitting a greater role for markets in setting prices. Significantly, during the first two years of the Ahmadinejad Administration (2005-06) inequality worsened in both rural and urban areas, possibly because higher inflation hurt those below the median income level more than those above it. This is not so much an indication that Ahmadinejad was insincere in promising redistribution but how difficult it is to redistribute income without fundamental changes in the country’s distribution of earning power (wealth and human capital) and political power, which determines access to government transfers from oil rent. Despite a lack of improvement in inequality, poverty has declined steadily in the last ten years. Figure 3 shows the proportion of individuals who were poor (the Headcount ratio) during 1984-2006 using separate rural and urban poverty lines. Poverty rates increased sharply during 1984-88 but, contrary to popular belief, fell during the economic reconstruction and market reforms. Poverty rose again briefly when the economy had to adjust to the balance of payments crisis of 1994-95. Since then, poverty has declined steadily to an enviable level for middle-income developing countries. Despite claims to the contrary, during the eight years of the Khatami Administration, poverty fell by more than 2 percentage points each year. 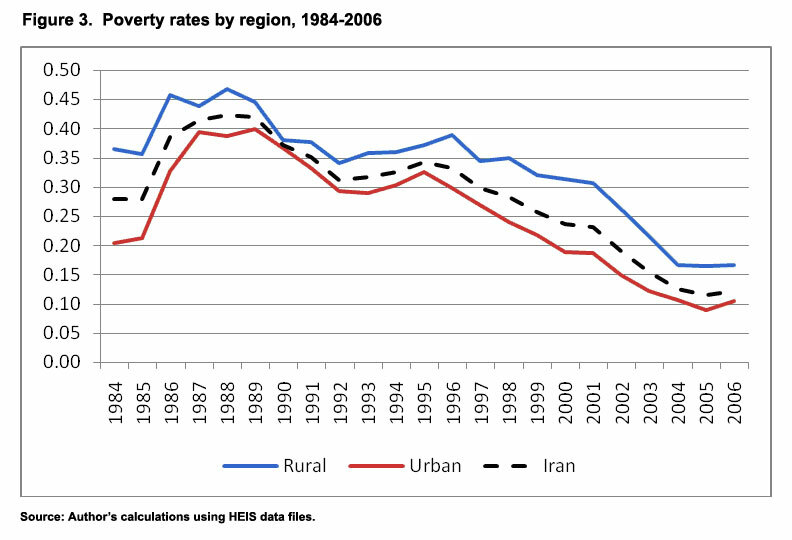 Significantly, in the first two years of the Ahmadinejad government, urban poverty appears to have increased by 1.5 percentage points, or about 680,000 individuals (rural poverty remained unchanged). Given the huge inflow of resources into the economy in 2006 and the Ahmadinejad government’s active redistributive efforts, the increase in urban poverty is quite striking. The data for 2007 and 2008 are not available to reach a definitive conclusion on the current administration’s efforts at redistribution and poverty reduction, but the available evidence on inequality and urban poverty does not bode well for his re-election. Perhaps the greatest achievement of the Revolution during its 30-year history is the expansion of educational opportunities, especially for women and rural families. 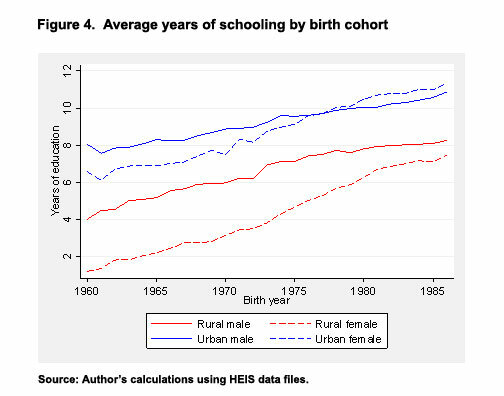 Figure 4 shows the impressive gain in education by the least educated group — rural women. Their average years of schooling increased from about 40% of their male counterparts for women born in the 1960s (who started school during the Shah’s White Revolution) to about 90% for those born in the late 1980s (who started school after the war with Iraq). Urban women have now surpassed urban men in average years of schooling, a phenomenon that led Iran’s Parliament to seriously consider and partially implement affirmative action for men in entering university! Increased access to free education from primary to university has equalized educational attainment between individuals. The Gini index of inequality of years of schooling for adults born in the 1950s was in excess of 0.60, compared to 0.35 for cohorts born 20 years later, which is a substantial decrease in education inequality in just one generation. However, there is evidence that educational attainment still depends greatly on family resources. Education inequality is likely to worsen as private education, both at the university and high school levels, continues to expand. Another major equalizing achievement of the country in the last 30 years is reduced fertility, especially in rural areas, thanks mainly to increased education and improved access to health and other basic services (electricity and piped water). Together with women’s gains in education, family planning has substantially advanced gender equality in Iran, bringing social pressure to improve women’s status in law. In rural areas the average number of births per woman fell from about eight in the mid-1980s to about two in 2006. The poor’s access to basic services has substantially increased: during 1984-2004 access to electricity by the poorest quintile (bottom 25%) in rural areas increased from 37% to 94% and to piped water from 31% to 79%. Remarkably, as a result of the extension of these services, by 2004, 80% of these households owned a refrigerator, 77% a television, and 76% a gas stove. There are very few countries (e.g., South Korea) that have combined economic growth with increased equity. Iran is not one of them. Nevertheless, much has been achieved in terms of improving the lot of the poorest section of the population. Even so, many Iranians seem disappointed with the material improvements of the last 30 years. There are good reasons why. In the last ten years, a huge inflow of oil revenues has taken place without any improvement in income inequality. Added to this is a lack of government transparency, which has fueled suspicion about how the oil riches are being spent. Ahmadinejad’s populist rhetoric has intensified fears of corruption and distrust of the rich in a country where wealth accumulation is held in low esteem, no matter its sources. Indeed, the proper purpose of politics and governance in Iran is considered to be redistribution much more so than promoting economic growth. As the Revolution enters its fourth decade, with oil prices down for the foreseeable future and the disappointing results of the latest experience with populist politics already evident, it would be interesting to speculate if this narrow view of politics is likely to change. The June 2009 presidential election is a good time to find out. See Djavad Saleh-Isfahani, “Are Iranian Women Overeducated?” The Brookings Institution (2008), https://www.brookings.edu/opinions/2008/0305_education_salehi_isfahani.aspx. Djavad Salehi-Isfahani and Daniel Egel, “Youth Exclusion in Iran: The State of Education, Employment and Family Formation,” Working Paper, The Brookings Institution (2007), https://www.brookings.edu/papers/2007/09_youth_exclusion_salehi_isfahani.aspx. Djavad Salehi-Isfahani, “Revolution and redistribution in Iran: poverty and inequality 25 years later,” Department of Economics Working Paper, Virginia Tech University (2006), http://www.filebox.vt.edu/users/salehi/Iran_poverty_trend.pdf.